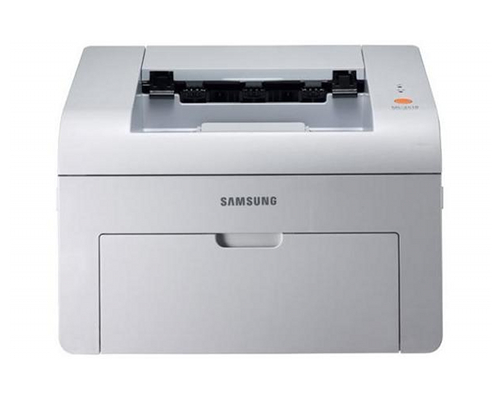 Introduced in 2006, the Samsung ML-2571N is a consumer-level monochrome laser printer that offers an extremely small footprint, quality prints at relatively fast speeds, and built-in network support, making it possibly for strong choice for the home office, home network, or very small office environment, where its lack of paper finishing options and small capacity will not be an issue. The ML-2571n measures 13.93" by 11.69" by 9.68" and weighs 12.3 lbs, making it less heavy than other Samsung consumer laser printers and around the same size, though its footprint, compared to most printers, is extremely small. It will fit on a desk alongside other equipment without any trouble, but also on its own table, in a cabinet, or on a credenza. The printer produces pages at a very good 24 pages per minute when printing A4-sized sheets and 25 pages per minute when processing letter paper. It includes a 250 sheet multi-purpose tray and a 1-sheet manual feed tray, as well as a 100-sheet face down output tray. It can print to media sized between 3" by 5" and 8.5" by 14" and to transparencies, labels, postcards, and envelopes. The printer has an effective output of 1200 by 1200 dpi, again ensuring print quality competitive with higher-end laser printers. The printer includes 32 MB of RAM, four times more than offered by other Samsung consumer laser printers. It also includes a USB 2.0 port, an IEEE-1284 Parallel port, and a 10/100 Base-TX Ethernet port, allowing for compatibility with Legacy PCs and full network support without relying on sharing or external printer hosting devices. To further ensure compatibility, Samsung includes drivers for every version of Windows beginning at with 98, many flavors of Linux (support for Red Hat 8 and 9, Fedora Core 1-3, Mandrake 9.2-10.1 and SuSE 8.2-9.2 are included), as well as both Mac OS and Mac OS X. Furthermore, the printer includes support for PostScript3 and PCL6, meaning that it will be possible to print from DOS-based applications, something not offered by many of the lower-end Samsung consumer lasers. There are no paper finishing options available for this printer. Automatic duplex printing is unsupported, as are the many sophisticated stacking, sorting, and stapling systems offered in higher-end work printers. The printer is further disqualified from professional use by its 150 sheet paper capacity, which will likely be completely acceptable in a home office setting but woefully undersized (150 sheets is less than half of a ream of paper, and many offices go through at least 250-500 sheets in a day, meaning that this particular model's toner would require replacement many times a week and that the printer would be down several times a day to reload paper). Some users complain that the printer produces a great deal of noise, even when compared to other models like it. Additionally, other users complain that the printer, over extended periods of use, begins to jam with some frequency. The printer, like most models, does not include cables for connectivity. While this is a minor inconvenience, it is worth noting, as some environments may not already have spare Parallel, USB, or Cat-5/5e/6/6a/7/7a cables to connect the printer. Some users also complain that setup can be tedious and difficult, especially because Samsung does not include a printed manual. Additionally, early Mac OS X drivers, like the ones included on-disc, offer very few printing options, requiring that changes be done via the printer's web interface. However, a recent driver update corrects many of these problems. 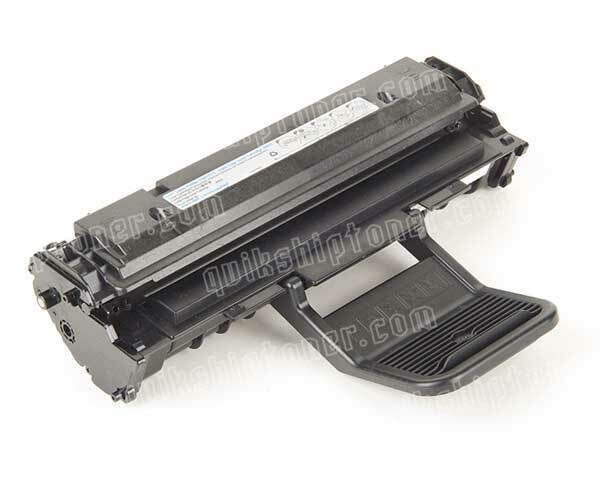 Review it: "Samsung ML-2571N "
The ML-2571n ships with a starter toner cartridge capable of producing 1000 sheets rated at approximately 5% coverage. Replacement cartridges for the printer have a capacity of 3000 sheets rated at approximately 5% coverage. The 2571N's cartridges have a drum unit built into them, meaning that costs go up -- replacement cartridges are almost the cost of a new printer -- but that the amount of maintenance necessary in order to maintain printer function does go down. 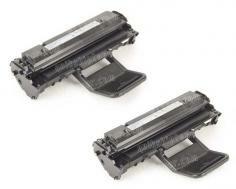 ML-2571N (ML2571N) 2Pack of Toner Cartridges - 3,000 Pages Ea.